For both political and policy reasons, the left is desperately trying to maneuver Republicans into going along with a tax increase. And they are smart to make this their top goal. After all, it will be very difficult – if not impossible – to increase the burden of government spending without more revenue coming to Washington. But how to make this happen? President Obama is mostly arguing in favor of class-warfare tax increases, but that’s a non-serious gambit driven by 2012 political considerations. Moreover, there’s presumably zero chance that Republicans would surrender to higher tax rates on work, saving, and investment. To be sure, the tax code is riddled with inefficient and corrupt loopholes. But those provisions should be eliminated as part of fundamental tax reform, such as a flat tax. More specifically, every penny of revenue generated by shutting down tax preferences should be used to lower tax rates. This is a win-win situation that would make America more prosperous and competitive. It’s also important to understand what’s a loophole and what isn’t. Ideally, you determine special tax breaks by first deciding on the right benchmark and then measuring how the current tax system deviates from that ideal. That presumably means all income should be taxed, but only one time. So what can we say about the internal revenue code using this neutral benchmark? Well, there are lots of genuine loopholes. The government completely exempts compensation in the form of employer-provided health insurance, for instance, and everyone agrees that’s a special tax break. There’s also the standard deduction and personal exemptions, but most people think it’s appropriate to protect poor people from the income tax (though perhaps we’ve gone too far in that direction since only 49 percent of households now pay income tax). Sometimes the tax code goes overboard in the other direction, however, subjecting some income to double taxation. Indeed, because of the capital gains tax, corporate income tax, personal income tax, and death tax, it’s possible for some types of income to be taxed as many of three or four times. Double taxation is a special tax penalty, which is the opposite of a special tax break. The good news is that there are some provisions in the tax code, such as IRAs and 401(k)s, that reduce these tax penalties. The bad news is that these provisions get added to “tax expenditure” lists, and therefore get mixed up with the provisions that provide special tax breaks. This may sound too strange to be true, but here’s a list of the biggest so-called tax expenditures from the Tax Policy Center (which is a left-leaning organization, but their numbers are basically the same as the ones found at the Joint Committee on Taxation). Since this post already is too long, I’ll close by simply noting that items 2, 4, 7, 8, 11, and 12 are not loopholes. They are not “tax expenditures.” And they are not “spending in the tax code.” Every one of those provisions is designed to mitigate a penalty in the tax code. So even if lawmakers have good motives (i.e., pursuing real tax reform such as the flat tax) when looking to get rid of special tax breaks, they need to understand what’s actually a loophole. But since politicians rarely have good motives, there’s a real threat that they will take existing tax penalties and make them even worse. That’s another reason why tax increases should be a non-starter. Another article of tax ignorance. How can you write an article on tax loopholes without providing a definition of a tax loophole? Tax loopholes are defined in the case law and they are first and formost – illegal. People are in jail today for promoting and participating in them. Under Ronald Reagan, all tax loopholes were done away with. Today, demagogues and largely uninformed economists cite lawful deductions that they do not like and call them loopholes to rally the similarly disaffected to their side. No one is going to jail for depreciating their corporate jet over 5 years rather then 7 years. Why don’t you start by giving us a definition of a tax loophole then give us an example of one that is in the Internal Revenue Code. Hint: don’t waste your time, there are none. That is why they are illegal, they are not in the Code. And stop telling the world that the Code is full of them. 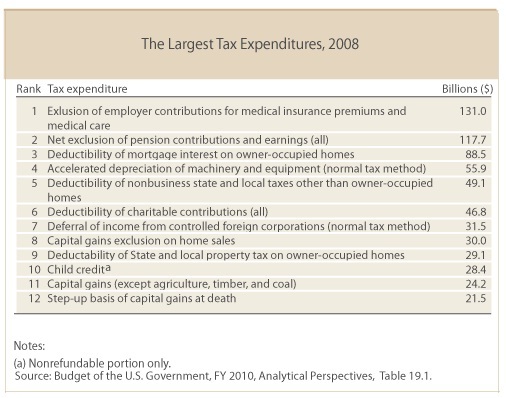 on July 6, 2011 at 12:03 am Obama Justifies Raising Taxes as Cutting Spending in Tax Code | Camarillo Publishing Co.
Great article and a true story. Our government, the last, and the present does not care anything about doing the right thing, they only care about their progressive agenda to tax and spend us into oblivian. The printing presses are still printing 24-hrs a day, there is no longer any gold in Fort knox, the Army’s 8th tank division has been reassigned and no longer protects Fort Knox, that in itself must tell us all something. At a Monopoly game at your house, all of the game pieces go back to the bank, at the end of the game. When you play Monopoly at the Federal Reserve house, you will lose. The Fed takes all of your substance, and puts you to work on the Federal Debt Plantation. The objective of Commerce is always Conquest. It doesn’t feel good to be conquered.